GrumpysPerformance.com • View topic - is backpressure hurting your combo? Re: is backpressure hurting your combo? Indycars wrote: Did the temperatures from the IR Gun give any clues as to where in the exhaust pipe the blockage was located ??? 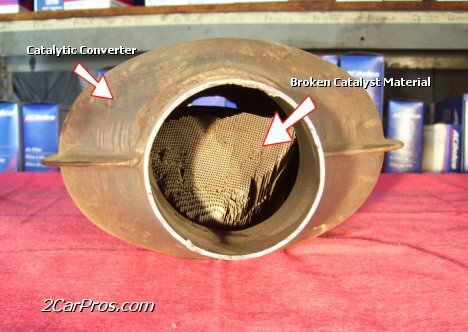 if you have an older CATALYTIC CONVERTER, its rather common for the core to break up and partly clog the exhaust. while it may not be your issue its smart to be aware if the potential problem and check it out. 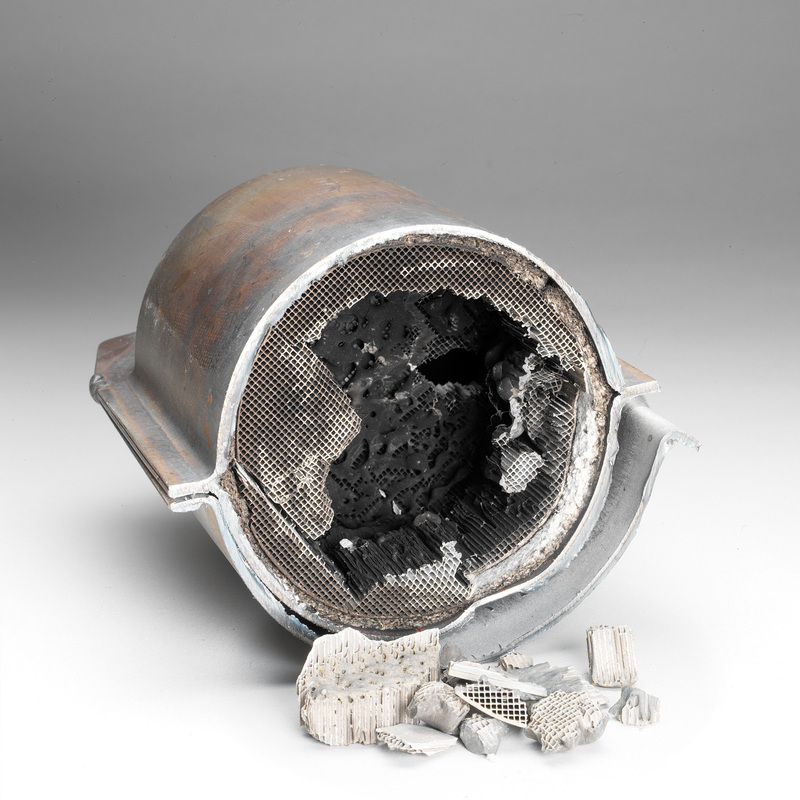 I got these pictures off the internet but its a fairly common issue too have several chunks of melted CAT come loose ,we found several chunks restricting the exhaust catalytic converter core and exhaust pipes in several corvettes where it transitioned from 3" down to 2.5" diam. HSR 406 down on power or at least peak RPM power? 6sp 3.91 gears, some where between 10:1-10.6 cr, SLP cold air kit, MAS gutted, TPIS air foil, TPIS AFPR, Superram, MAC headers, Mac under drive pulleys, MAC cat back, Relocated MAT, E-Tec 200 heads, SDPC Vortec manifold, ZZ-409 cam. During the dyno runs my WOT intake vacuum climbed to 2-1/2" of water, the exhaust backpressure was 2-1/2 PSI measured at the 3" single exhaust part of the pipe. The car peaked at 404 RWTQ at 4100 RPM and 360 RWHP at 5400 RPM and then slowly dropped to 345 RWHP by 6000 RPM. 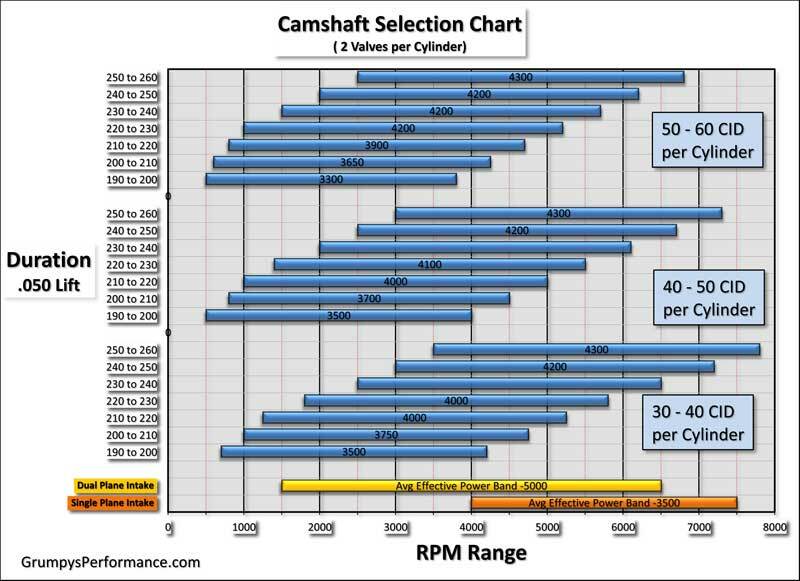 I thought the car should have peaked around 5800 RPM to maybe 6000 RPM and have been giving this some thought and want some opinions on the low RPM peak. Maybe the heads are too small for a 406, Intake restriction too high, exhaust too restrictive, cam too small? I know the CR is slightly low but that should not effect peak RPM. The car runs excellent but I am looking for more power, I would like to get 400 RWHP with this car. I took it to the strip last Friday and on a 90 degree night it went 12.13 at 113 MPH at a race weight of 3600 LBS but that is not that much better then the previous 355 SR combination. Any thoughts on the combination and low peak RPM? and talk to the tec support guys about what they suggest but DON,T mention anything any other cam manufacturer suggests during the conversations, just present the info on the parts used in that combo, rear gear ratio, compression, etc and see what they suggest, then make up your mind. HEY GRUMPYVETTE?].... I do have a ZZX cam (240/240 @ .050 .595/.595 lift with 1.6 rockers, 112 LCA) laying around that I could try. I decided to try the smaller ZZ-409 cam since I only have between 10:1 and 10.6:1 CR and was concerned that the ZZX would not perform well with the 10:1 CR. What do you guys think of trying the ZZX cam?" 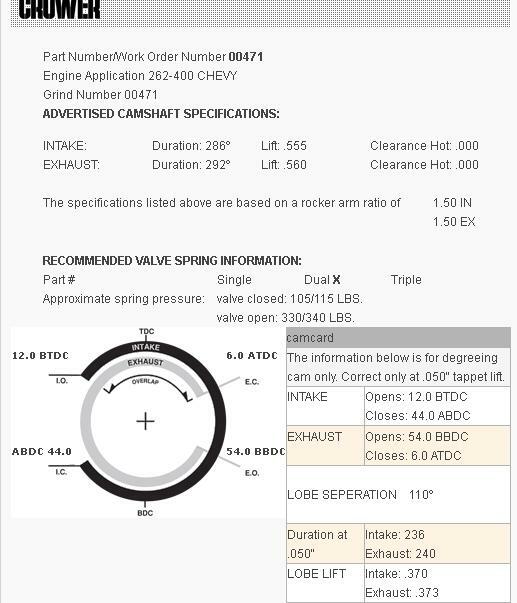 I recently had a guy I know complain that his car seemed to be really restricted or reduced in the power it made, a few checks with an IR heat gauge and a vacuum gauge ,showed a restricted catalytic converter with the core, honeycomb basically 70% clogged, we replaced a defective 02 sensor that was making the engine run excessively rich, which caused the problem then replaced the catalytic converters on both sides with new low restriction higher performance versions and he swears it responded with a huge gain in the "seat of the pants dyno" feel.
" GRUMPY? I recently swapped from 1 .625" shorty headers and a 2.75" dual exhaust to 1.75" full length headers and 3" exhaust with an (X) pipe to reduce the cars effective back pressure, the car runs noticeably better once the rpms exceed about 5000rpm but my 60 foot times got slower and I seem to have lost some lower rpm torque, do I need to make a change to increase my exhaust back pressure?" first lets point out a few things, headers are designed to increase cylinder scavenging, increasing cylinder scavenging in theory reduces the level of previously burnt exhaust gases , and increases the percentage of fresh fuel/air entering the combustion chamber and being compressed , thus increasing the potential power the engine can make. but in most cases this also means some of the new fuel/air charger is drawn out thru the exhaust before the valves seat on the compression stroke. 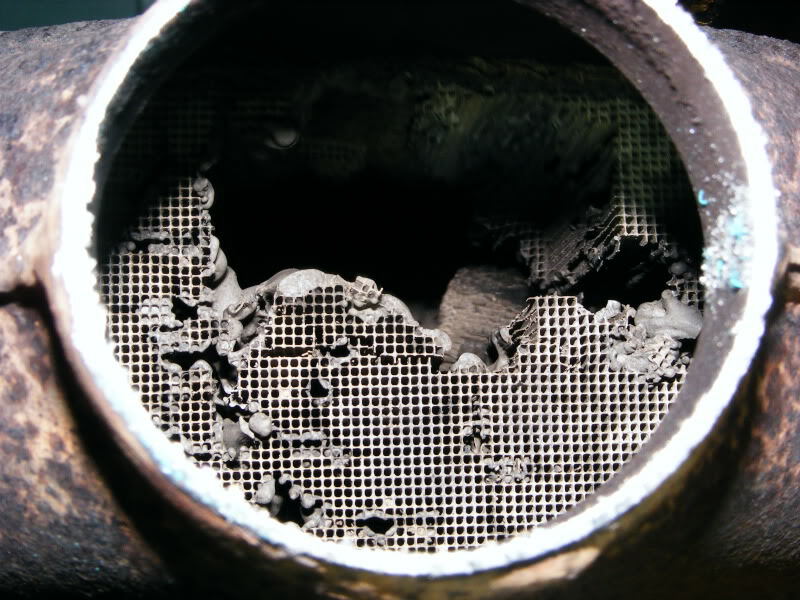 the diameter of the primary pipes and the length of those pipes plus the collector they feed all effect the exhaust gas velocity as does the cars displacement, compression ratio and cam timing, its also common that changes to the cylinder scavenging will require changes to the jetting, or intake design to maximize the cylinder fill efficiency. and the intake design will also effect how efficiently the cylinders get fed and scavenged by the exhaust gas inertial drawing in the next intake runner charge of fuel/air mix. 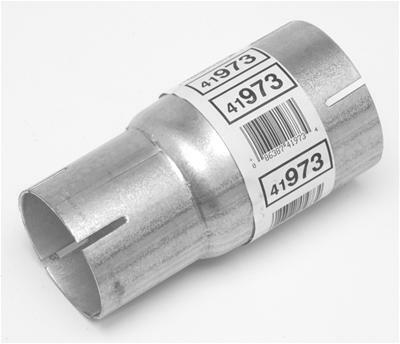 back pressure is always bad, but if you increased the header size too much you reduced the exhaust gas velocity thus reducing the cylinder scavenging, this has zero to do with back pressure, but a good deal to do with effectively using the velocity of the gases flowing out of the cylinder to draw in the next fuel fuel air charge. 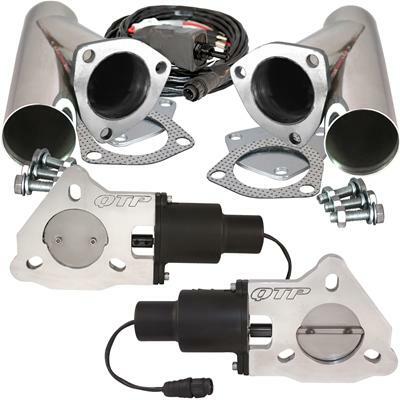 in many cases adding an extended collector to the headers will get you back the previous headers efficiency, in many case shorty headers use the exhaust system they are matched with as an extended header collector, swapping to a full length header and a larger exhaust effectively reduces the working length of the exhaust. BACK PRESSURE will ALWAYS restrict the engines power levels IF the engines properly tuned, the cam timings correct and youve got the car geared correctly, if you do some careful investigation Im reasonably sure youll find the increased exhaust header primaries and lower restriction exhaust slowed the exhaust gasses and may have EITHER reduced or increased cylinder scavenging , as youve changed the pressure levels in the cylinder and/or the change in scavenging changed the effective fuel air ratio, in the engine, this is VERY COMMON, and in many cases just using a vacuum/pressure gauge on the intake and header collectors and reading the plugs condition or ideally using a fuel/air ratio meter and an infrared temp gun on the headers where they exit the cylinder heads,will show you that change. in many cases a tighter LSA cam will help increase the power levels as the slightly change overlap tends to offset the increased scavenging and increase torque due to the valves closing a bit earlier. in some cases retarding the cam will allow the engine to breath at the slightly increased rpm levels the better scavenging allows. 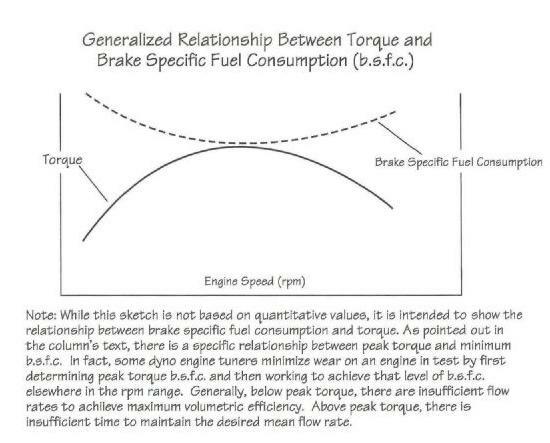 in most cases youll need to make changes to the tuning to try to get as close to 12.5:1 -13:1 on the fuel air ratio as you can, as thats where most engines make the best power levels, in some cases a cam change to more closely match the ideal cylinder scavenging will be required or a rear gear change to match a change in the effective rpm range where your now making power. 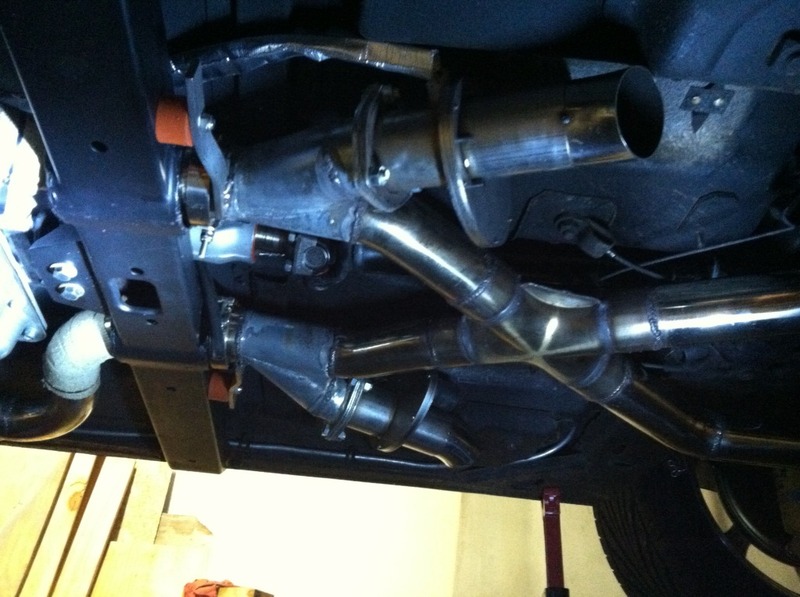 Ive seen several cars where cheaper "LONG TUBE HEADERS" like these in this picture, failed to provide the intended power until an extended section like the one posted just below was added, which markedly increased the effectiveness of the header scavenging. 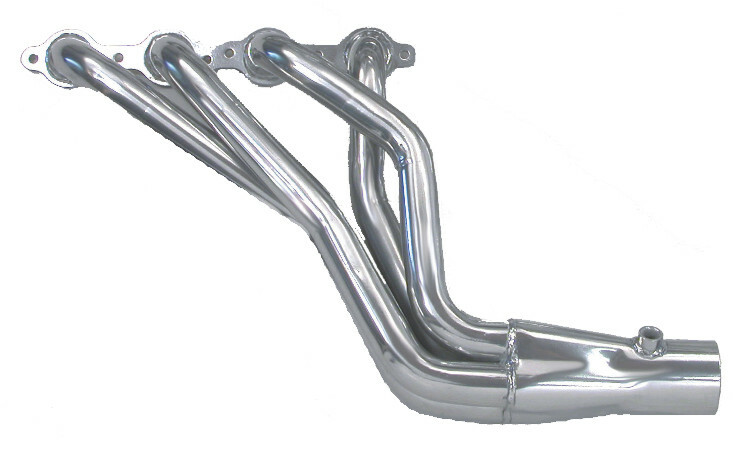 keep in mind most of the less expensive headers are designed with low cost and ease of installation as far more important goals in the fabrication process than maximizing power levels, plus the header manufacturer has zero idea as to the cam timing compression, displacement or other factors in the engine they will be matched with. "For me the first really serious look at how to muffle a high-performance race engine without loosing a significant amount of power started in 1980 when I built a 400lb-ft, 404hp 350 to replace the very lame 158hp 305 in my California-spec Pontiac Trans Am. 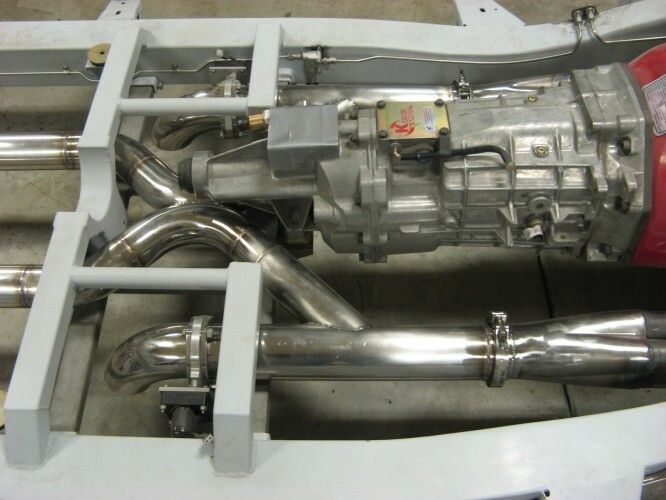 Having worked very hard to build a pump gas fueled engine (gas was really bad in those days), that would cross the 400 hp barrier, I was very disappointed to find that, regardless of what mufflers were used, the output dropped by some 20 lb-ft and 25 hp. Having had some experience designing a no-loss system for the original style British Mini Coopers, I felt confident I could pull off the same stunt for significantly bigger V-8 engines. The result, aided by an acoustics expert friend, was the Sonic Turbo. This design went on to be manufactured by Cyclone (now a division of Walker/ Dynomax). After the smoke cleared from a big muffler shootout (done at Gale Banks facility and published by Hot Rod magazine), a pair of 2.25-inch Sonic Turbos (the 2.5-inch ones were still a couple of months off) sunk everybody else's 2.5-inch items. This, it seemed, was just what the hot rod fraternity wanted and they sold by the hundreds of thousandths. 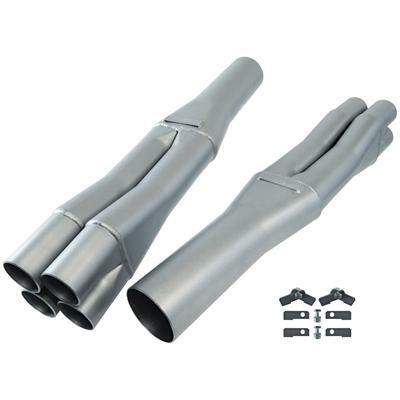 That was good, but more importantly, it appeared to spark the industry into aggressively pursuing significantly more functional mufflers and exhaust systems. The result is that 20-some-years later, all the necessary components to build a highly effective, no-loss system are at hand, and not necessarily that much money either. All that appears to be lacking is widespread know-how as to what is needed to achieve this happy state of affairs. As of now, we are going to make a start on putting that right. 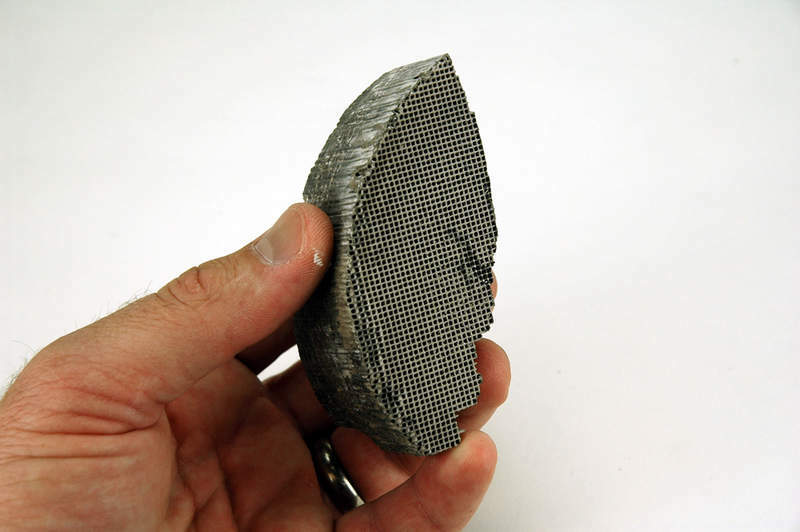 At 115 cfm per square inch, that's the equivalent to a pipe only 2.1 inches in diameter. This is an important concept to appreciate. Why? 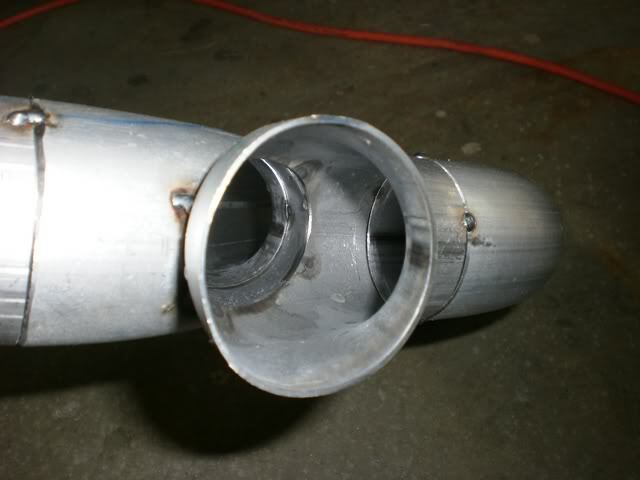 Because so many racers worry about having a large-diameter pipe in and out of the muffler. This concern is totally misplaced, as in almost all but a few cases, the muffler is the point of restriction, not the pipe. 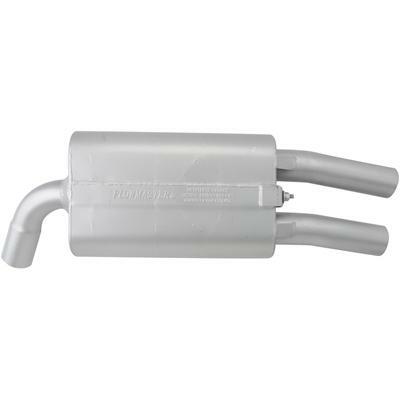 The fact that muffler core flow is normally lower than the connecting pipe can be off set by installing something with higher flow, such as a 4-inch muffler into an otherwise 2.75-inch system"